Have I mentioned that April and May were busy running months? 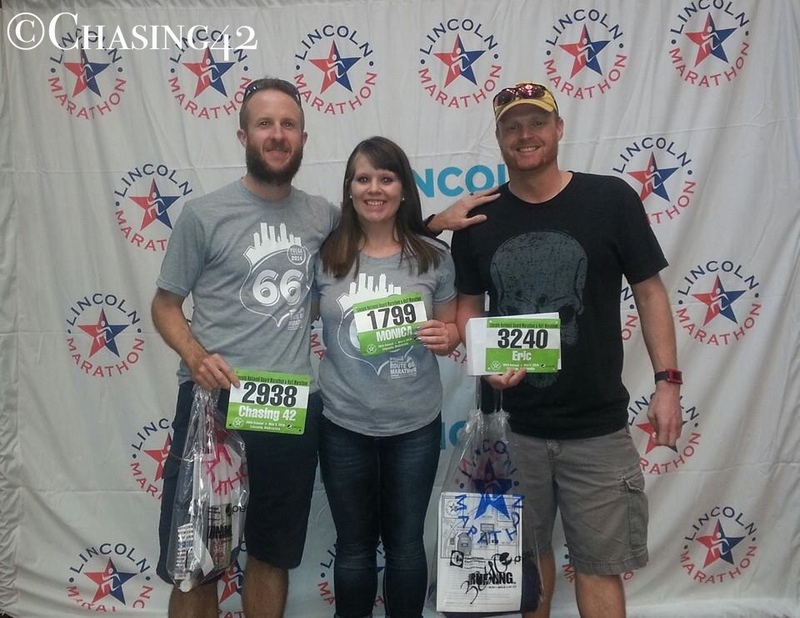 So, as soon as I got home from running the Iowa Able 5K & 10K on May 2nd, I hopped in a car with a few friends and headed down to Lincoln, Nebraska to run a marathon the next day. Are you still following? I should probably back up and explain how I ended up in such a whirlwind scenario, although if you’ve read my blog in the past, then you probably aren’t surprised by this series of events. 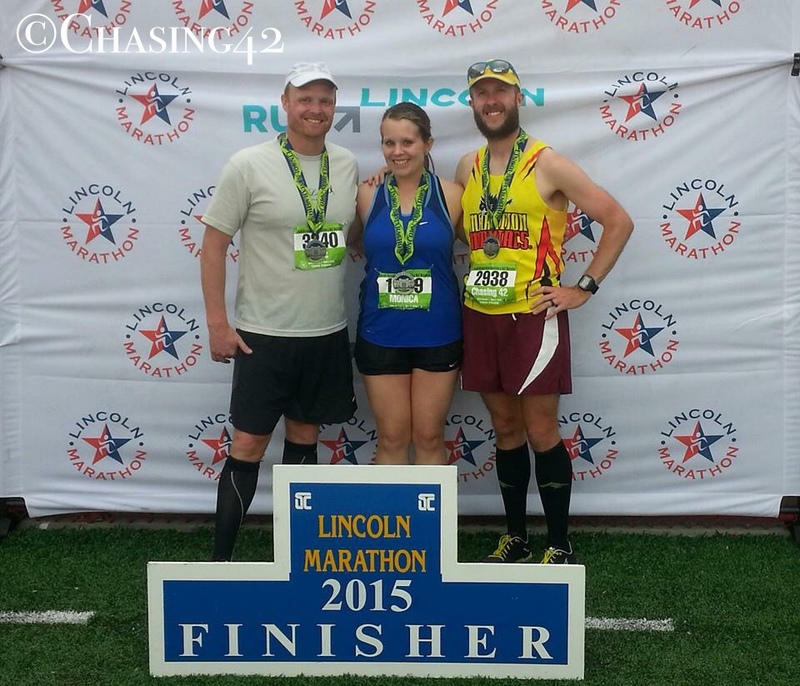 Many months prior, as I was beginning to pull together my spring racing schedule, a friend suggested the Lincoln Marathon. I hadn’t given it much thought because a) I’d run the GOATZ 50K in Nebraska, thereby checking the state off my list, and b) I could probably live content for the rest of my life having never returned to the state again (no offense to my Nebraska friends 🙂 ). 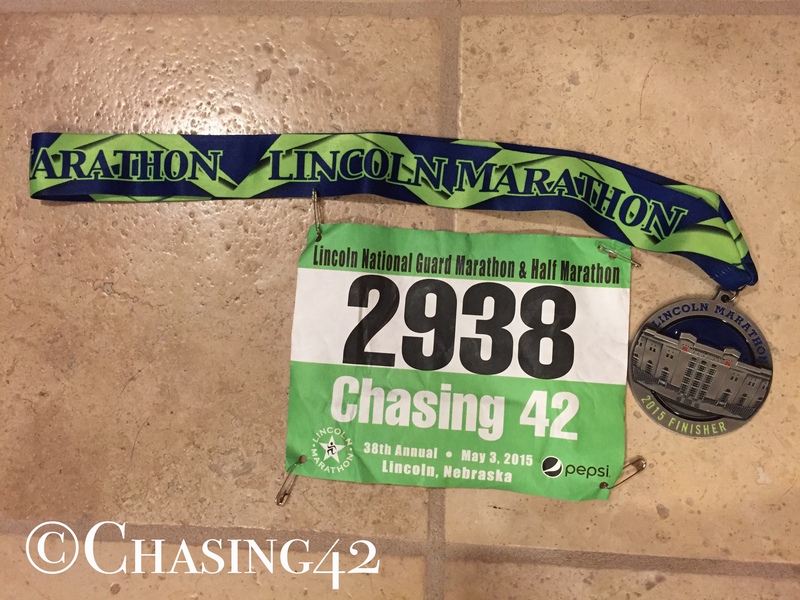 However, I knew that of the two major marathons in Nebraska (Lincoln & Omaha), this was by far the better of the two in terms of organization, crowd support, and course appeal. What I didn’t realize until the week before was that it also sold out ridiculously quick. I was alerted to the need to register the morning that registration opened in order to ensure my spot, a fact that I laughed at a bit. However, registration opened on a Saturday morning at 3 or 4AM, and I’m normally up early for a long run anyway so I went ahead and registered to lock in my place. Sure enough, the race sold out in around 8 hours, which surprised me to no end, but I had my slot, and a smile on my face. The main motivation for running this race was so that Eric and I could pace our friend to her first sub-4 hour marathon. Although neither of us had any extensive pacing experience, aside from my recent half-marathon success, we ran with her consistently every weekend so we knew we could push her while keeping her out of her own head as much as possible. The same wildcards (weather, nutrition, terrain) applied, of course, but it was also an additional opportunity to take another racing trip with a couple of good friends before heading out east. 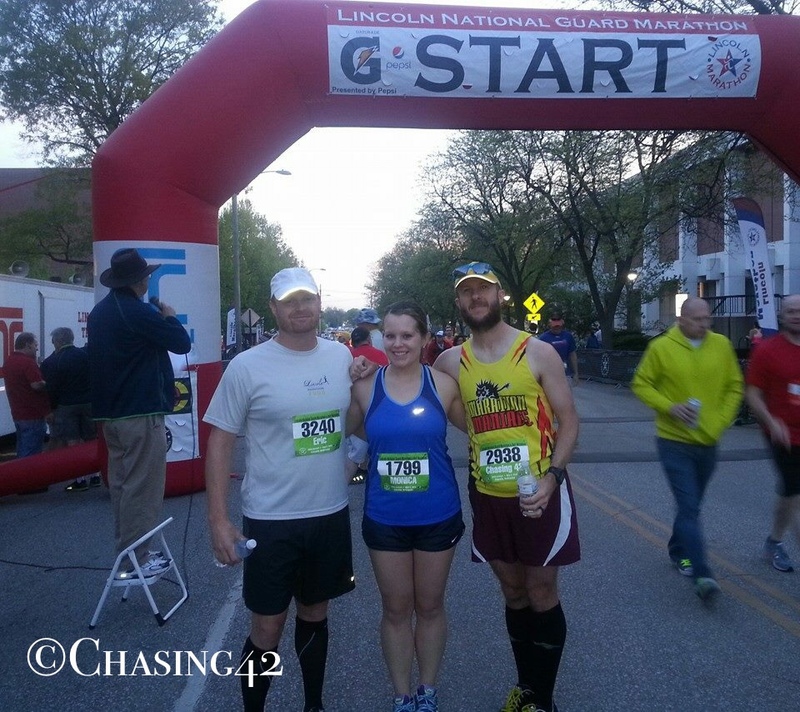 So, fresh off of a 5K PR and plenty of energy, we hopped in the car and headed for Lincoln. We got to town in plenty of time to hit up the expo, which was surprisingly large and full of some excellent vendors. Perhaps I had pleasantly underestimated the quality of this race, eh?! We picked up our packets, and took some time to wander around the expo and resist the temptation to buy unnecessary running gear. We then headed over to the free pasta dinner, which was a great perk and quite convenient as well. After dinner, we drove back to the friend’s apartment that we were staying at, and settled in for the evening. It was a nice, low-key evening and we were able to get plenty of sleep before waking up early to head over to the start. Eric and I were doing our best to inject plenty of levity into the morning, and it made for a light-hearted pre-race routine. The starting area had plenty of access to indoor restrooms and porta-johns, and everyone was milling about. With temps in the 50’s and the sun coming out slowly, I could tell that heat might be a factor later so it was really just a question of how far we could make it before the temperature began to impact our pace. Eric had been nursing a sore foot (which he later found out was a stress fracture) so he was uncertain of how the race would go and decided not to stick with us, which left the pacing duties to me. Since I knew the heat might be a factor later on, I decided to try and go out a bit faster than the needed 9:09/mile pace so we’d have some time in the bank for the later miles. We waited for about 10 minutes after the initial gun went off, and we were on our way! The first few miles ticked off smoothly, and the crowds thinned out pretty quickly so we didn’t need to do much weaving to stay together and on pace. I wanted us to stay ahead of the 4-hour pacer and I used him as a guide of sorts, while also monitoring our pace every 1/2 mile or so. The whole first half of the race was run along with the half-marathon, and the crowd support was superb. It was wonderful to be able to feed off of the energy around us, and we ran the first half below target pace, just as I had hoped. We hit the half-way mark with a few minutes in the bank (1:57:40), and the sun beginning to loom a bit heavier as the clouds parted and the mercury rose. It wasn’t a particularly hilly course up to that point, but we had logged around 1100 feet of elevation gain, which is still more than either of us were typically accustomed to in Ames. Alas, the second half of the race was another story. Once we left the half-marathoners to cross the finish line, the crowd support tapered off. As the heat and sun-exposure increased, our pace tapered off as well. It seemed to hit my pacing charge all at once around mile 14, and I could tell she was beginning to struggle a bit. Had the conditions been the same for the second half as the first, it would have no doubt been a very different story. However, the weather in Ames during the spring had not allowed for any amount of heat acclimation (2-3 weeks needed for proper acclimation) and it was taking its toll on her. Despite a few angry miles, especially during an annoying out-and-back portion of the course, she kept pushing and I kept us moving forward. This was by no means a result of under-training or lack of fitness, as she had pushed hard this spring and had a stellar training stint. We kept moving forward, focusing on relentless forward progress, and with the aid of plenty of water and ice, some forced nutrition, and some motivational preaching on my part, we kept knocking out the miles. When a race goes really well and every clicks, it is almost always an amazing feeling. However, I truly believe that we learn much more about ourselves when the race gets hard and our body isn’t sure it wants to do what our mind commands. Those are the moments that prove why we love running, love the thrill of the race, and why we voluntarily struggle and push ourselves beyond our limits when it would be much easier to give up or stay home for that matter. There was no giving up and her love of running pushed her forward, and it was a pleasure and an honor to be a part of that, and help in some small way as we made our way to the finish line. With a few miles to go, the burden seemed to be lifted a bit, and we picked up the pace and pushed toward the finish. One of the perks the race is finishing inside Memorial Stadium, and you can’t help but feel a thrill of energy as the stadium comes into site, and you round the corner onto the field. One final kick gave way to a strong finish on the comfortable turf of the 50-yard line and we crossed the finish line victorious in 4:23. We had conquered the beast once again, and it was a wonderful feeling! You all are amazing!!!! Congratulations on all of your finishes!!! !